I’m a simple guy when it comes to movies. Entertain me, and I’ll be pleased. Not every movie needs to be some groundbreaking, never before seen story that rewrites how films are made. Take 2013’s “Gangster Squad”. It has taken an unnecessary amount of heat because…..I have NO IDEA. It is familiar in a way, but it’s stylish, entertaining and action-packed with a ridiculously loaded cast. Screw all the Debbie Downers. I loved this movie. 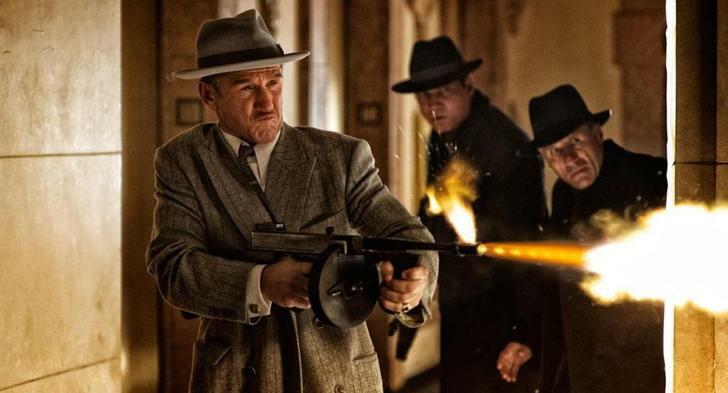 It’s 1949 in Los Angeles and former boxer turned gangster Mickey Cohen (Sean Penn) is taking over the city bit by bit. Gambling, prostitution, drugs, Cohen is buying up cops, judges and politicians left and right as fast as he can. One of the seemingly few clean cops, Sgt. John O’Mara (Josh Brolin) is fed up with what he’s seeing in a city he wants his family to grow up in. He’s approached by the similarly clean police chief, Parker (Nick Nolte), with an offer; assemble a small crew of officers and take the war to Cohen. O’Mara’s squad will work as their own separate unit, completely removed from the laws and rules that would typically limit officers. He puts his crew together, including roguish Jerry Wooters (Ryan Gosling), and goes to work, attacking casinos, bars and clubs all over the L.A. area. They immediately find success, but it’s only a matter of time before Cohen figures out who’s gunning for him. Can O’Mara’s Gangster Squad take Cohen’s illegal businesses out before he gets to them? There is little to nothing I didn’t like about this movie. Playing like a modern film noir, it’s a gem of a flick. It plays like a mix of “L.A. Confidential”, “The Untouchables” and “The Magnificent Seven”. If you put those three movies together and can’t get a winner, then you’re doing something wrong. Director Ruben Fleischer (“Zombieland” and “30 Minutes or Less”) is at the helm of a damn entertaining movie. It feels like a throwback film to the Hollywood glory days with a huge cast — much, much more on that later — to go with a well-written script, exciting, well-choreographed action and a story that never really slows down. More than anything, it is just F-U-N. That’s all. There are good guys and bad guys, cops and gangsters, a femme fatale and not a damsel in distress. Is it so wrong for a movie to just be entertaining? I read a surprising amount of reviews that were highly critical of this movie. Maybe I missed something, but I loved it from beginning to end. Watching the trailer for the first time last year, I have no doubt my eyes were as big as dinner plates. A movie about cops and gangsters in post-WWII L.A. already drew me in, but with this cast?!? It’s a ridiculously deep, very talented cast. Because there is so much talent assembled, we’re not talking in-depth character studies, but there isn’t a weak part in the bunch. For starters, Josh Brolin as the hard-headed, stubborn O’Mara is a hero cop gem. A WWII veteran, he’s sick of Cohen and his antics so given a chance to take him down a whole lot of notches, he jumps at the chance. He has a pregnant wife (Mireille Enos) weighing on his mind, but he wants to get the job done, on principle alone. Brolin is aided by Ryan Gosling as Wooters, the cop who sees what L.A. has become and just doesn’t care too much, but he’s given a reason to care while also getting the love interest, Grace (Emma Stone), Cohen’s girl. Uh-oh, more issues! The names already mentioned would be enough for most movies, but not this one. Penn gets to ham it up as real-life boxer turned gangster Mickey Cohen, sneering and intimidating his way into the part. This is an out-and-out villain, a bad guy you just love to hate and can’t wait to see get taken down. Nolte makes the most of his smallish but effective part as Chief Parker, the chief of police who sends O’Mara on his dangerous, illegal mission. 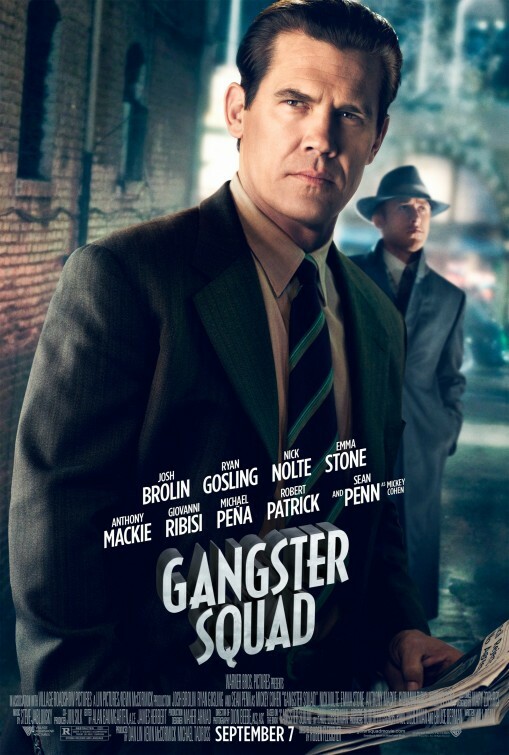 Also look for Sullivan Stapleton as Jack Whalen, a bookie and friend of Wooter’s working in Cohen’s organization (a supporting but excellent part), Holt McCallany as Lockwood, Cohen’s bodyguard and enforcer, and Troy Garity as Wrevock, a hired killer working for Cohen. 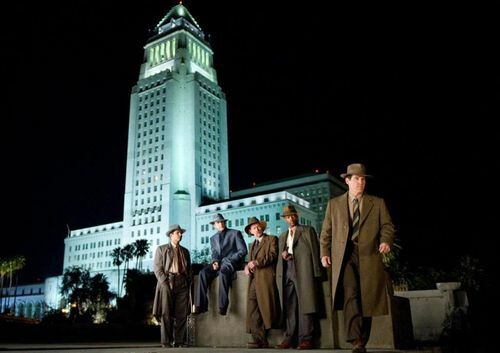 Not surprisingly, a certain part of the cast caught my eye….O’Mara’s Gangster Squad! Uh-oh, it’s another men-on-a-mission movie! Assemble a crew of misfits and specialists and let them go to work. How can you lose? Brolin and Gosling are the stars, showing off that hero-sidekick chemistry that every group of specialists needs. But wait, there’s more! Rounding out the crew/squad are Harris (Anthony Mackie), a specialist with gun or knife looking to clean up the streets of drugs, Keeler (Giovanni Ribisi), a WWII intelligence officer and expert in radio technology, Kennard (Robert Patrick), the veteran cop and part-Wild West lawman who favors a six-shooter, and Ramirez (Michael Pena), a young Mexican officer who’s looked down upon by much of the rest of the force because of his Mexican blood. It’s a good group of some really solid actors, all comfortable and willing to take a supporting part to flesh out an impressive cast. 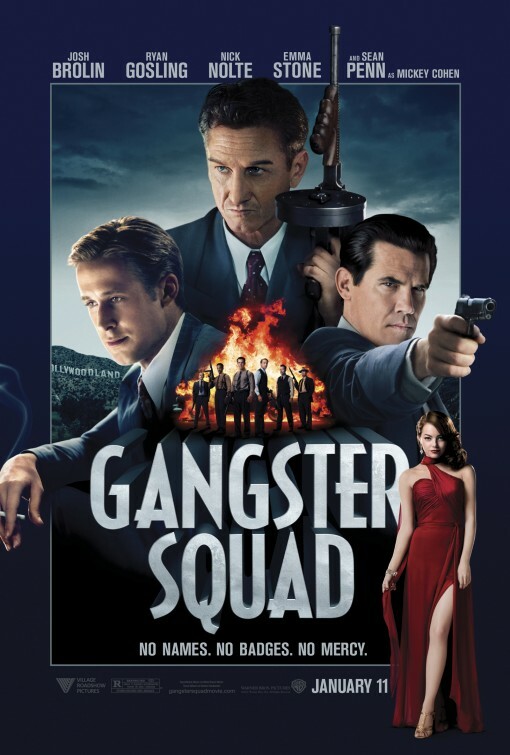 Originally supposed to be released in summer/fall 2012, “Gangster” was pushed back for re-shoots following the Aurora shooting at a movie theater. What remains is still an action-packed movie that will appease most moviegoer’s needs for some shoot ’em up action. The script never goes long without a gunfight or shoot out of some sort. A couple different sequences stand out, including a failed ambush in a busy street in Chinatown and the finale at the Park Plaza Hotel especially leaving their mark. It’s pistols and machine guns to aid the throwback feel with some pretty cool uses of slow-motion without going overboard. Bloody but not overly graphic, the action sequences are just another selling point. It’s hard to describe this movie without describing the style. The late 1940s (and heading into the 1950s) were an inherently cool time looking back on them. Cops and police officers wore a suit, tie and a hat. The cars were ridiculously cool, the streets even more so, and Fleischer and Co. took that to heart. Part of the appeal here is the look of the movie, like we were transported to 1949 Los Angeles. Just like a scene where O’Mara and crew walk away from the L.A. City Hall, there’s a cool factor that’s hard to touch or classify. It’s stylish and cool….because it is. How about a montage of the Squad doing their work to big band music? It works. There is style on display in every scene whether it be the clothes and sets or the quick, speedily delivered dialogue. Even the closing credits are throwback-looking postcards of the time. I liked everything about this movie and look forward to future and repeat viewings. I agree, this def gets an exaggerated “meh” from the mass audience but i thought it was great for what it was trying to be. I won’t like, there were several times my knee-jerk mental reaction to much of it was “look no further than L.A. Confidential for a masterful film in this noir LA crime genre”, but just like Tim said – not all films need to be groundbreaking. The things I liked best about this were: Sean Penn totally EATING SCENES UP as the villain mobster, and Ryan Gosling playing an extremely likeable, part lazy part best-there-is, goofball drunk cop.